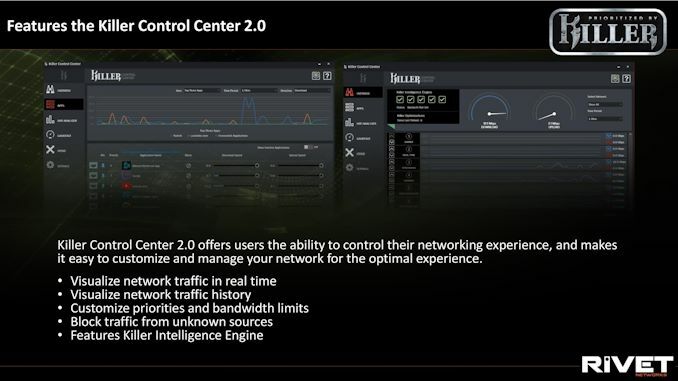 One of the core criticisms of the Killer networking hardware has been hardware reliability and drivers. On the last generation product, the company did away with those by working with Intel, using Intel hardware, and Intel’s driver stack. Intel’s part of the deal was to include the hardware and IP from the Killer team in order to enable Killer’s features: Advanced Stream Detection, the Killer Intelligence Engine, and prioritization. 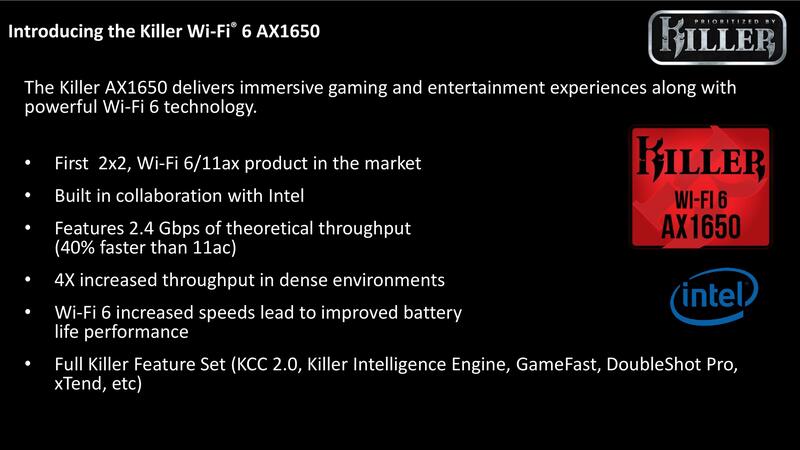 This launch is in collaboration with Intel again, for the Wi-Fi 6 enabled AX1650 chip, available for integration in devices or as an M.2 module. 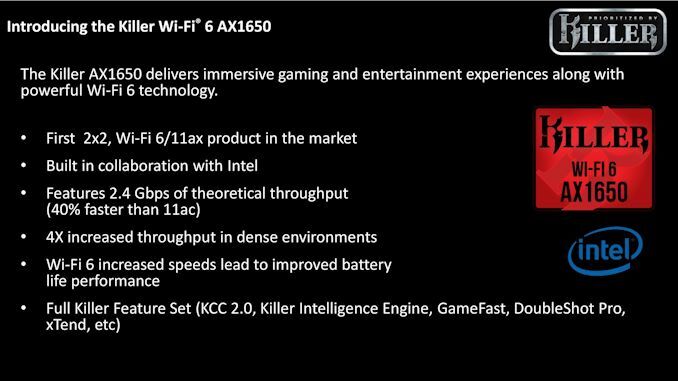 Intel recently announced its Wi-Fi 6 module, the AX200. The Rivet Networks Killer AX1650 is an evolution on this card, supporting the same features: up to 2.4 Gbps of theoretical throughput with a 2×2 connection better latency in multi-user scenarios, extended battery life in mobile devices, and sharing the same base driver stack. 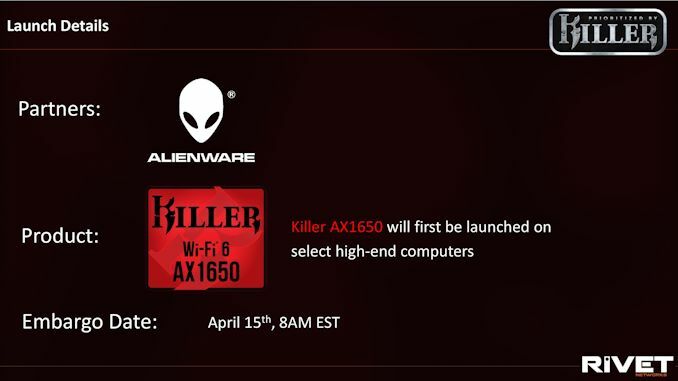 The Killer AX1650 promises to actually beat the Intel module to the market, and will be shipping in Alienware devices in April. Wi-Fi 6 as a standard affords most of these benefits – up to 40% better performance over 802.11ac, increased throughput in dense environments, and a better race-to-sleep environment. The value add for the Killer version comes in its quality of service offering above and beyond what the Intel solution provides. The company behind the Killer product line, Rivet Networks, spun out of Qualcomm’s Atheros division back in 2014 and has since built its latest technology with whichever partner can offer the best combination of features. For its Wi-Fi modules since 2017, this has been Intel, and that partnership is now in its second iteration. As mentioned above, Intel builds what Rivet needs into its base chip, and that chip is sold both as an Intel solution or a Killer solution with the added features enabled, but with the same hardware underneath and the same base driver stack, with additional tweaks on the Killer side. 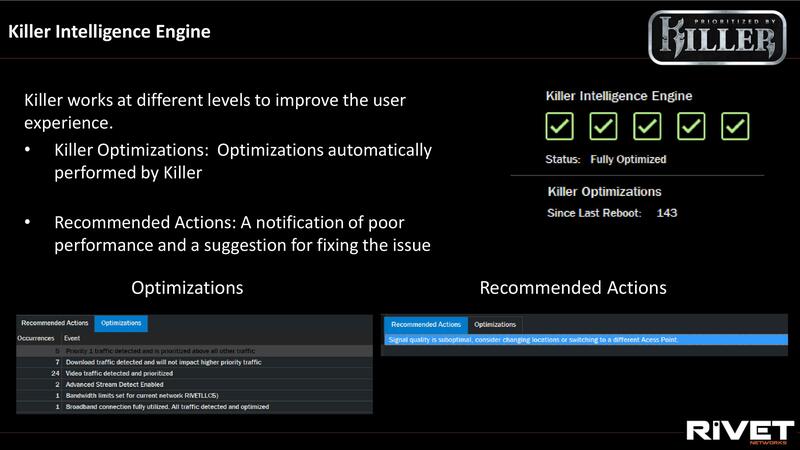 Those tweaks enable the Killer product to do several things that the Intel version cannot: it uses trained algorithms to detect types of network traffic (streaming, gaming, VOIP, video, downloads) from the traffic patterns, and then calibrates the priority queue accordingly, ensuring that higher priority and latency sensitive traffic leaves the system first. The software automatically comes with a pre-programmed whitelist of software with auto-priority, and users can adjust the priority on the fly; Rivet also performs their own internal checks nightly to ensure those top 1000 applications are still detected properly. By offloading the network detection algorithms and prioritization process to the hardware, one of the promoted benefits of Killer is lower CPU use compared to other software-only optimization solutions. What this means is that the two main problems users have with the Killer implementation, the hardware and the drivers, share the common backbone of Intel – without the Killer software installed, the hardware performs as the Intel solution should. Aside from the Advanced Stream Detect hardware/software integration, Rivet Networks has been building out the offerings that the company provides, all built using the underlying hardware as a point of acceleration. One of these is the Killer Intelligence Engine, which gives a list of optimizations that the software provides to give a cleaner networking experience, as well as recommendations that the user can do as well. These optimizations include, for example, video stream detection being placed at low priority, or preferentially pushing traffic through different connections based on reliability, latency, and bandwidth. In speaking with Rivet Networks, the KIE has actually been a super tool for its customers in diagnosing networking issues. Another prominent feature is xTend, which allows users to use the Wi-Fi module connected to a Wi-Fi network while also broadcasting as an access point. It uses time slicing to manage the two, but if users need to extend their network (say, in a restricted hotel room), then the Killer software can help manage this. For the AX1650 product, this means a full Wi-Fi 6 access point, allowing devices like the Samsung Galaxy S10 to take advantage of the connectivity features that Wi-Fi 6 provides. For customers that want to integrate Killer into a laptop or onto a motherboard with multiple Killer connections (Wi-Fi plus wired), then the package also allows for Double Shot Pro, allowing users to configure which pipe data can go down, prioritizing for bandwidth and latency for users that can take advantage of multiple connections or networks. We’ve actually been in contact with Rivet Networks for several years. One of the key highlights in discussing with them is that they are not afraid of feedback – they get a lot of it, as you might imagine. The team at Rivet has several times met with me over the years to discuss their hardware and software offerings, and I’ve seen the product line evolve over time, with some of my input making it into the final versions. There’s a lot of positivity in the team, and the genuine belief that they have a differentiating product that provides enthusiasts with substantial benefits to their gaming system. Being based on the Intel solution, the Killer product is a bit more expensive than Intel, and if it was no good, Rivet’s partners wouldn’t continue using the product generation after generation. As an objectively neutral bystander, given I converse with all of Rivet’s competitors in a similar fashion, I can understand where the Killer product offerings do offer that level of differentiation compared to the competition, and compared to Intel’s solutions. OEMs like Dell, Acer, and MSI, all tend to agree for their gaming portfolio, and have been using the Killer solution for multiple generations. 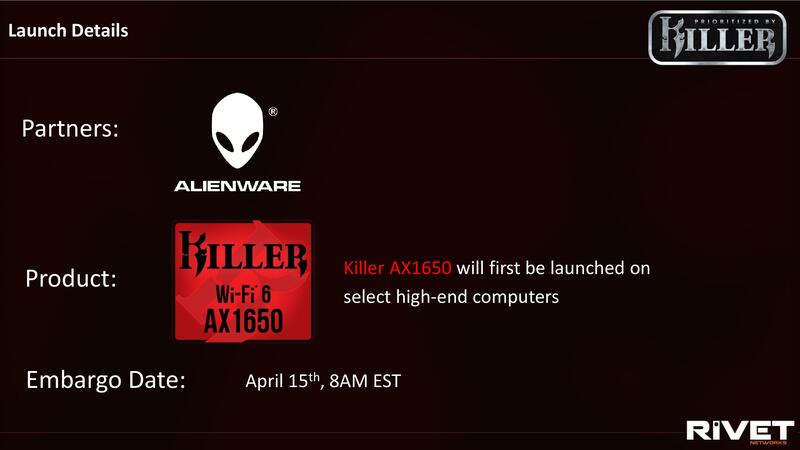 The first partner with Rivet Networks for the AX1650 is Dell’s Alienware, who will be shipping with the new chip in April. Given our conversations with vendors at CES, it looks like the Computex show in June is going to be a hub of a lot of new hardware, so we might expect to see additional announcements there. For users looking to buy the AX1650 separately for their system, an associated M.2 module will be available on Amazon in due course.